Everything started in 2012 while visiting Vienna, Austria. My husband and I had been living in Italy and were finishing our time in Europe with several weeks of touring around. Those of you who have backpacked know that when you’re trying to make your money go far, you are doing everything as cheap as possible. Our goal was to spend 20 euros a night for accommodations and 30 a day on food! Like I said…as cheap as possible. We loved living in Europe because it introduced a whole new lifestyle we didn't grow up with: eating fresh, walking everywhere, architecture, music, art, art, and more art. We had become accustomed to our senses being over stimulated and finding beauty everywhere. But one day, I walked past a coffee shop…one that stopped me dead in my tracks. I looked at Greg and immediately said, “I don’t care what it costs; we have to eat here!” and in I went. We found a seat. I ordered a latte and a dessert and relaxed as though I was in heaven. I looked at the architecture and décor of this simple coffee shop and felt so inspired. I had been personified in a room and I had to step in to explore. It was as if I was getting to know myself better by being there. "I had been personified in a room and I had to step in to explore. It was as if I was getting to know myself better by being there." 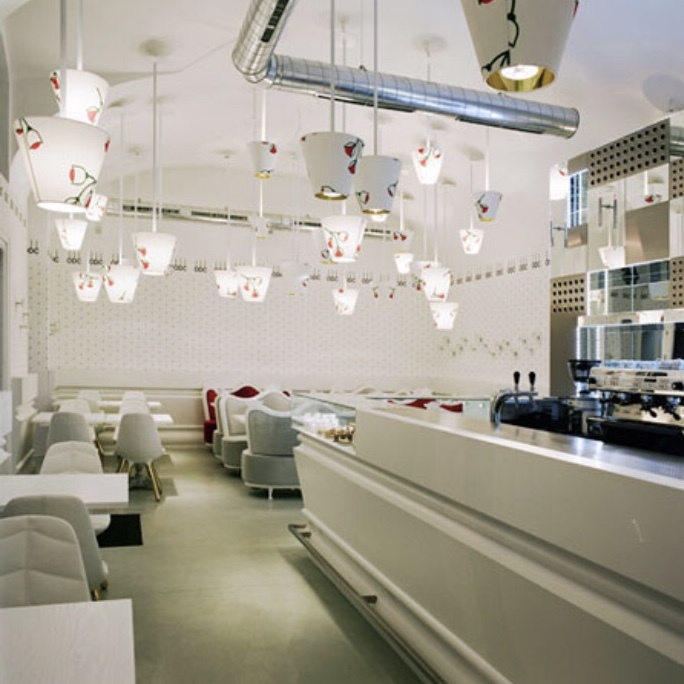 The restaurant was called OCD Orlando di Castello, designed by Viennese architect Denis Kosutic. He said what had inspired him for this project was, "Queen Elizabeth, the rapper 50 Cent and a girl from Tyrol." You can see from the below photos how he asserted to juxtapose such soft elements along the exposed metalic nuts and bolts. He turns traditional design on its head by turning floor lamps into ceiling lights and pairs traditional, though customized, wallpaper with benches that break up into small kidney like shapes - drawing the eye around the room. I have never forgotten the feelings I had which drew me in and I think about it all the time. For me, Brit & Barclay is my place to learn about myself, grow, and hopefully collaborate along the way. There is no better way to learn than from each other! I did an honours degree in history, so working with antiques and vintage clothing is a perfect fit since it's always been about the stories, which is why historical furniture and architecture will always inspire my design process. Breathing new life into old pieces is also a skill I’m working on because I appreciate well-crafted furniture and I really hate to see the old things tossed aside for poorly made substitutes. I’m constantly torn between juxtaposing a modern twist onto antique furniture, and reviving the memory by recreating an exact replica. I think there's so much to cherish about history and so honouring the period with a replica is fantastic, especially when it was originally designed by an artisan who learned his craft through generational training. However, there are also contemporary designers doing something we haven't seen before like Timorous Beasties or House of Hackney and they should be admired and embraced. Combining the past with the present creates a beautiful intersection and puts us in the very center of making our own history. All in all, I love detail, textiles, patterns, and colour. I love fashion and interior design. There's nothing better having the option to recreate your individuality every day. And being that I believe we are made in the image of a creator, it's not surprising that we ourselves are made to create - 'subcreators' as J.R.R. Tolkein defines it. We are truly so blessed to live in a time and place where using our artistic talents is possible. Living in a peaceful and free country has awarded so many privileges that it would be a shame to take them for granted. So here I am...grateful and proud to be able to pursue my passions. If you've reached the end of this monologue, then thank you for your curiosity. I welcome you to come along this ride with me as I learn a little more each day and attempt to keep pushing boundaries, encourage boldness, and find joy in the beauty that we can make. ...and ended with a vision. We are currently an online store shipping worldwide. We will be collaborating with local business in Regina, Saskatchewan to work out pop-up locations through out the year. We of course do viewings of our store by appointment. Contact us right now to scoop up that one of a kind piece you just have to have!